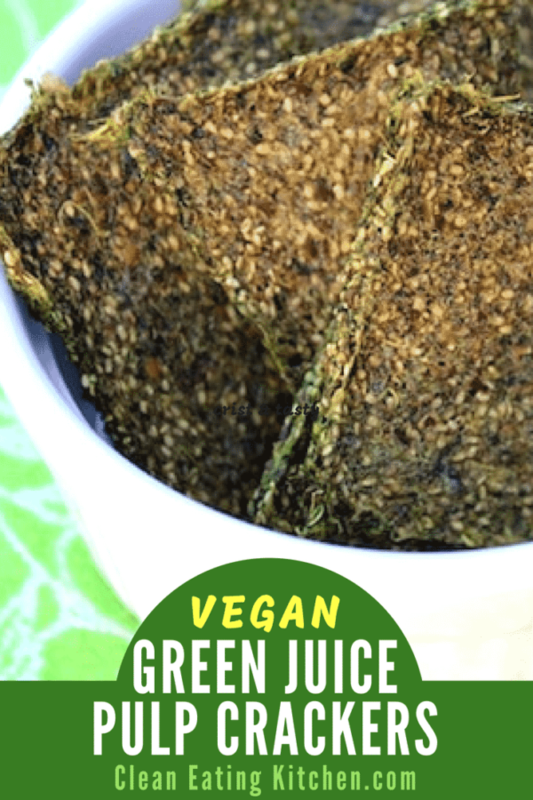 I’m so excited to present you with these dehydrated green juice crackers. 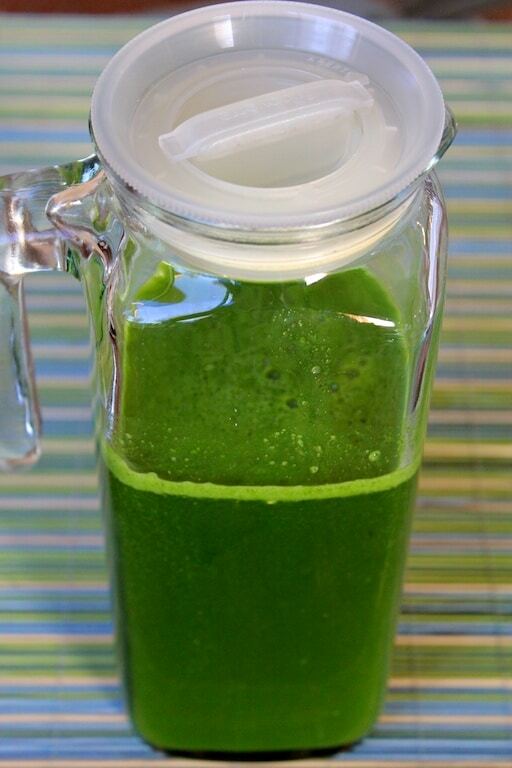 This is a great way to use up the pulp leftover from green juicing! I’ve tried several times to make crackers or something from vegetable juice pulp as opposed to throwing it away. I’m pleased to report that I finally made a cracker that tastes great! I started with my bowl of greens (kale and parsley) and fruit and vegetables (cucumber, ginger, one blood orange and one lime). 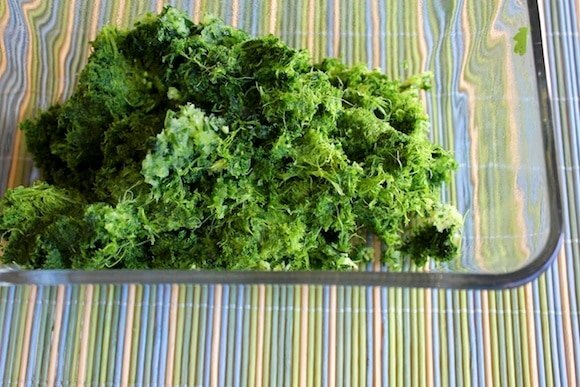 First, you start with making the juice from only the greens (or whatever pulp you are going to use to make the crackers). The juice was very, very green! 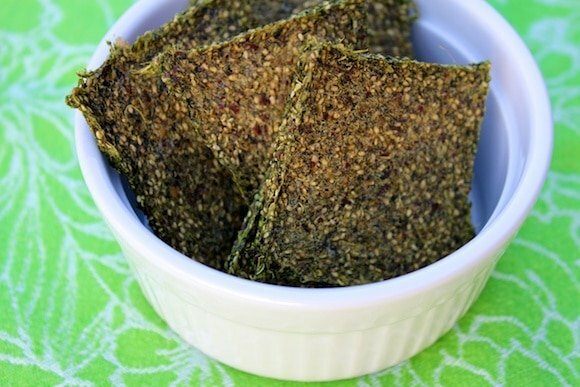 Rather than using the pulp from all of the veggies including the fruit which might have altered the flavor I was going for, I only saved the pulp from the kale and parsley to use in the crackers. 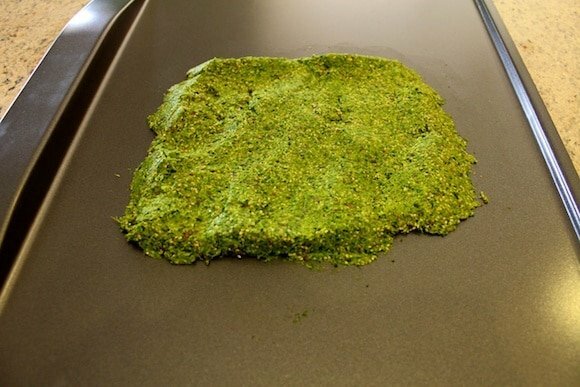 I then plopped the mixture onto a baking sheet to go into the dehydrator (you could also use your oven if it has a fan and has a minimum temperature setting close to 135 degrees at the most). I recommend an Excalibur dehydrator. I flipped them once after 12 hours and then another 12 hours they were crispy and ready to eat! See the printable recipe at the end of this post. I really like the flavor of these crackers, it’s pretty amazing that they are made from green pulp. 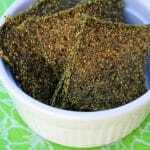 The tamari and nutritional yeast pumps up the flavor and the pulp, flax and chia seeds give them a wonderful texture. 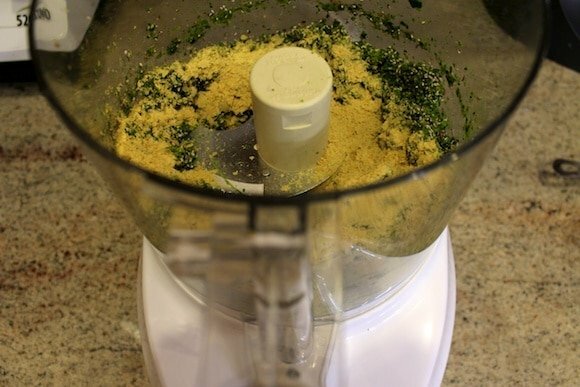 Combine ingredients in a food processor and whirl until combined. 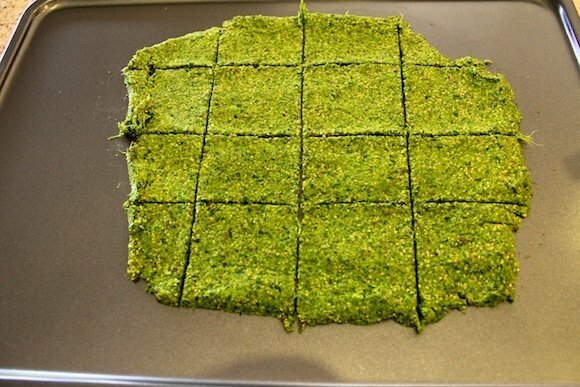 Pour mixture onto a dehydrator sheet or baking sheet and flatten as much as possible using a spatula. Then, use a knife to score batter into crackers. Dehydrate on 120 degrees for 12 hours and flip. Dehydrator for another 12 hours (24 hours total) or until completely dry and crispy. If using an oven, use the minimum temperature setting with the convention fan on and keep a close eye on them so they don’t burn. I did have not tried making them in an oven so I cannot recommend how long it will take to cook them (let me know if you try it this way!). Pin this post to your favorite healthy recipe Pinterest board! Also, please join my weekly newsletter list to get all the latest news and recipe links delivered directly to your inbox. Carrie, you amaze me! I can’t wait to try these! 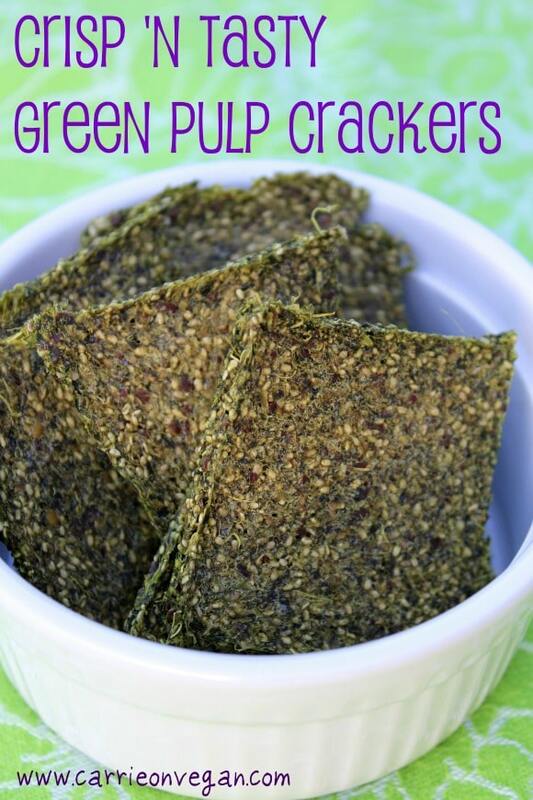 I’ve been trying to figure out to do with all my veggie pulp and these look awesome! Hi Gina! Thanks, but I can’t take credit for the idea of using pulp to make into crackers, although I did come up with this recipe on my own after a few dismal failures. I think I originally heard about it on the Choosing Raw blog. Do you read this one? 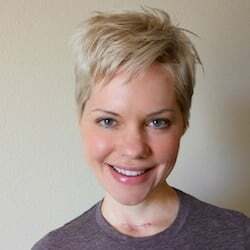 It is excellent and the author (Gena) shares your name, although she pronounces it like “Jenna.” Here is the link: http://www.choosingraw.com. 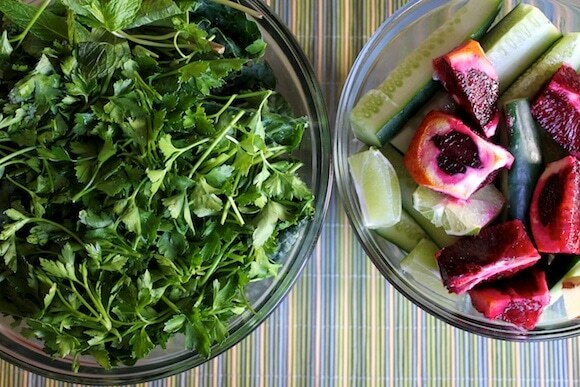 We love our juicer and use it a few times a week – usually with carrots and fruits. We haven’t quite learned to do much with the pulp yet, since our oven doesn’t go low enough to dehydrate. Any other suggestions would be greatly appreciated! Even though people in the raw food world claim that dehydrating foods on higher temperatures can destroy helpful enzymes, I don’t know how much of this is fact. 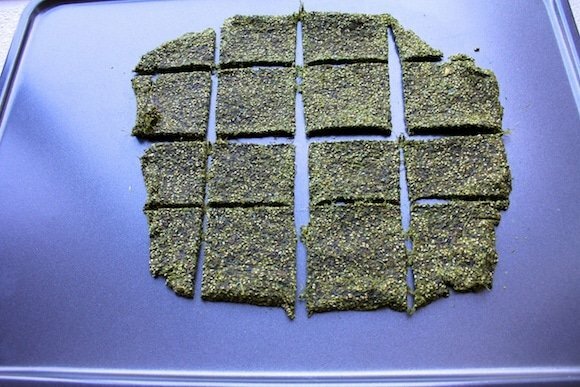 So, you can actually use your oven to make traditional raw recipes like these crackers. 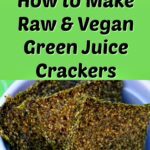 One website that I read (the link is here: http://www.choosingraw.com/choosing-raw-juice-pulp-crackers/) says you can bake the crackers in an oven at 325 for 30 minutes. I have tried this and it works pretty well. I am a cracker junkie and those look absolutely delish! I bet they tasted as good as they look. 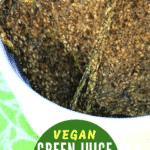 I just discovered this today as I was searching for a way to not let all that beautiful veggie pulp go to waste (been juicing a lot, lately). I will try it out. I know this is a corny question, but… where did you get that pitcher? I love that it’s tightly sealed, and glass with a spout. Looks very practical for daily juicing. Hi Dominique, sorry it took me awhile to respond to your question. I got the pitcher at Crate & Barrel years ago. I agree, isn’t it great? I love the tight-fitting lid. Let me know if you make the juice pulp crackers and how you like them! Thank you for your recipe! We just started juicing and I have been trying to figure out what to do with the pulp. I made your crackers today, but I used mostly carrot and beet pulp – which doesn’t seem to be the best. I am looking forward to trying tomorrow using mostly green pulp. I didn’t have nutritional yeast, I put wheat germ and ground flax seeds instead. Do you ever add seeds or nuts? Thanks so much for your recipe! You have inspired me. I made the crackers, love them BUT they were crisp when I finished them. I allowed to cool completely. After store 3 hrs. or so they reverted to chewy not crisp. UGH!! How do you store yours? What type container or wrap?? thanks!!! Hi Janet! Hmmm, I am thinking that they didn’t get absolutely 100% dehydrated? Otherwise, that shouldn’t have happened. However, if you live in a damp climate, then I could see that as a possibility. I store mine in a tightly sealed container, but not the fridge. How did you store yours? What a disappointment, Janet! How about storing in a ziploc bag with all of the air pressed out? Thanks for all your help. I will try ziplocs & let you know outcome. I hope to do pot & zuchinni chips Mon. These crackers literally SAVE me! I just finished a 30 day juice fast, and made a couple of batches of these in my final days. Now, slathered with hummous, or a nice big slice of tomato they are so amazing and I cannot feel guilty in any way when eating them. My only problem is overindulgence. Just curious, did you ever work out a nutritional chart for them? I can input the ingredients, although it might be difficult to get nutritional information for pulp! (fibre, fibre and fibre). I’d love to know the breakdown if you ever figured it out! A great way to use up the pulp! Another great recipe for crackers. May have to try this. My efforts, like your first, making crackers from pulp were dismal. Not enough nutrition for me to cook for 24 hrs … will just be happy to make crackers that aren’t bad for me.